In April 2011, Pakistan tested a new missile, the Hatf-9 Nasr, designed to deliver nuclear warheads to targets within a 60-kilometer range. While scholars had inferred that Pakistan’s nuclear posture might require it to employ nuclear weapons against tactical targets on the battlefield, this was the first platform designed explicitly for that goal. This missile milestone occurred simultaneously with an impressive expansion in Pakistan’s production of fissile material, permitting it greater latitude to consider apportioning its growing force between a mix of battlefield and strategic targets. Pakistani decision-makers explained that they required such a short-range system to deter India from launching punitive ground force operations. Since 2000, Indian military planners have acknowledged that nuclearization has constrained the space available for conventional operations against Pakistan, and that as a result Indian military thinking has shifted to envision geographically limited, shallow ground operations, occurring over short time periods. After an Indo-Pakistani military crisis in 2001-2002 where it took weeks for India to mobilize its army in response to a terrorist attack on the Indian Parliament building, Indian Army thinkers modified plans and deployment schedules to be able to conduct such limited operations more quickly according to what became known popularly as the “Cold Start” doctrine, and which the Indian Army calls “proactive strategy options.” Pakistani decision-makers decided that there was a gap in their deterrence posture that India sought to exploit, and “therefore, the idea of Nasr was born, that we need to plug this particular gap,” as Khalid Kidwai, the long-time head of Pakistan’s Strategic Plans Division, told an audience in Washington in March. Sankaran’s article indirectly asks the question, “Does Pakistan’s development of tactical nuclear weapons make sense?” He concludes that it does not. He argues that Pakistan cannot employ tactical nuclear weapons without causing unacceptable civilian casualties within Pakistan, that Pakistani use of tactical nuclear weapons is unlikely to achieve major battlefield effects against Indian military forces, and that India has no plans or intentions to launch a limited war against Pakistan. In each of these assertions, he highlights an element of truth, but in each case the article proceeds further than the evidence merits. Second, even if Pakistan did use nuclear weapons, Sankaran argues they would be unlikely to have meaningful military effects. Why would Pakistan cause so many civilian casualties to itself if it might only destroy, as Sankaran argues, thirteen Indian armored tanks (p. 144, 145)? Sankaran draws on the earlier work of Zia Mian and A. H. Nayyar, and here too, Sankaran emphasizes an important point, which is that nuclear weapons are far more effective at killing civilians in cities than they are at killing tanks on a battlefield. But he understates the consequences that nuclear weapons would have on the battlefield by too narrowly focusing on quantifying how many tanks would suffer moderate physical damage. Even the possibility of nuclear use would force Indian forces to ride “buttoned up,” dramatically decreasing their situational awareness and degrading their effectiveness. If Indian tanks did not ride buttoned up, then exposed personnel would be extremely vulnerable to nuclear weapons effects. Even if tanks were maneuvering with hatches down, a nuclear weapon might not destroy the tank, but could still irradiate the crew, causing a ‘soft kill.’ Even if the crew survived, the exterior features of the tank, such as antennas, might be damaged, further impairing the tanks’ combat effectiveness. All of these effects would be even more consequential for lightly armored infantry vehicles or unarmored trucks. It would be incredibly difficult for the Indian Army to continue to prosecute ground operations in the face of a Pakistani nuclear attack. Third, Sankaran argues that Pakistan’s tactical nuclear weapons developments are unnecessary because India has no plan to conduct limited military operations against Pakistan and, even if it did, Pakistan has considerable ability to defend against an Indian incursion. I am sympathetic to the latter hypothesis, having argued, along with Walter Ladwig and Shashank Joshi, that Indian conventional force advantages over Pakistan are less substantial than are commonly believed. Even so, India—by dint of its much larger and somewhat faster growing economy—will one day have conventional superiority over Pakistan. Pakistani planners may be comforted by the arguments made by Ladwig, Joshi, Sankaran, and myself, but they apparently believe that Pakistan is either weaker conventionally now than outsiders have concluded or will soon be too weak to deter India conventionally. With regard to the former argument, that India is not planning a limited military campaign against Pakistan, Sankaran argues that no formal approval has been given to any “Cold Start doctrine” That may be technically correct, that the label “Cold Start” is largely the invention of journalists and non-governmental analysts. The label of the doctrine is somewhat irrelevant since it is incontestable that the Indian Army has conducted focused war planning for ground operations against Pakistan over the last fifteen years. Since 2000, Indian civilian and military leaders have said that limited conventional options remain despite the risk of Pakistani nuclear use. It would be foolish for Pakistani planners to assume that the thousands of Indian tanks on the Indo-Pakistani border will never be utilized. Additionally, it would make sense for Pakistani planners to conclude that if they were used, that any conventional war would be limited. Stepping back from the Pakistani case, Sankaran is grasping at a more foundational question: is it rational or irrational to develop tactical nuclear weapons when faced with a conventionally superior opponent? Vipin Narang has argued that nuclear postures involving tactical use of nuclear weapons have more successfully deterred conventional attacks than other possible nuclear postures. If Narang is correct, then Pakistan’s development of tactical nuclear weapons is intuitive. If Sankaran is correct, then Pakistan’s development of battlefield nuclear weapons is a puzzle. Certainly the Pakistani Army has institutional interests in exaggerating the risk from India, but what institutional interests does it have to argue that nuclear weapons—rather than more guns or more men—are the answer to that danger? If Sankaran is correct, his work invites scholars to consider what would lead Pakistan down this perplexing path. Christopher Clary is a research fellow at the Belfer Center for Science and International Affairs at Harvard University and a Ph.D. candidate in Political Science at the Massachusetts Institute of Technology. His research interests include the causes and consequences of nuclear proliferation and interstate rivalry in modern Asia. Vipin Narang, “Posturing for Peace: Pakistan’s Nuclear Postures and South Asian Stability,” International Security 34, no. 3 (Winter 2009/10): 38-78. Christopher Clary, “The Future of Pakistan’s Nuclear Weapons Program,” in Strategic Asia, 2013-2014, eds. Ashley Tellis, Abraham Denmark, and Travis Tanner (Seattle: National Bureau of Asian Research, 2013), 131-160. George Fernandes, “Inaugural Address to the 2nd International Conference on Asian Security in the 21st Century,” Institute for Defense Studies and Analyses, New Delhi, January 24, 2000, http://www.idsa-india.org/defmin24-2000.html and General V. P. Malik, “The Challenges of Limited War: Parameters and Options,” Institute for Defense Studies and Analyses, New Delhi, January 6, 2000, http://www.idsa-india.org/chief6-2000.html. Walter Ladwig, “A Cold Start for Hot Wars? The Indian Army’s New Limited War Doctrine,” International Security 32, no. 2 (Winter 2007-2008): 158-90. “A Conversation with Khalid Kidwai,” Carnegie International Nuclear Policy Conference, March 23, 2015, Washington, DC, http://carnegieendowment.org/files/03-230315carnegieKIDWAI.pdf. Natural Resources Defense Council, “The Consequences of Nuclear Conflict between India and Pakistan” , http://www.nrdc.org/nuclear/southasia.asp. Lt. Gen. (retd.) F. S. Lodi, “Pakistan’s Nuclear Doctrine,” Defence Journal [Pakistan], April 1999, http://www.defencejournal.com/apr99/pak-nuclear-doctrine.htm. A.H. Nayyar and Zia Mian, “The Limited Military Utility of Nuclear Weapons in Response to a Large Scale Indian Conventional Attack,” Pakistan Security Research Unit, brief no. 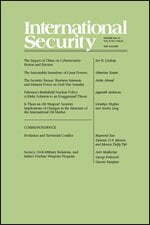 61 (November 11, 2010), http://www.princeton.edu/sgs/faculty-staff/zia-mian/Limited-Military-Utility-of-Pakistans.pdf. Walter C. Ladwig III, “Indian Military Modernization and Conventional Deterrence in South Asia,” Journal of Strategic Studies 38, no. 4 (2015); Shashank Joshi, “India’s Military Instrument: A Doctrine Stillborn,” Journal of Strategic Studies 36, no. 4 (2013); Christopher Clary, “Deterrence Stability and the Conventional Balance of Forces in South Asia,” in Deterrence Stability and Escalation Control in South Asia, eds. Michael Krepon and Julia Thompson (Washington, D.C.: Henry L. Stimson Center, 2013), 135-160. Vipin Narang, Nuclear Strategy in the Modern Era: Regional Powers and International Conflict (Princeton: Princeton University Press, 2014).